This ruler is designed to work with blocks on a 4 inch X 4 inch grid and also referred to as the 2 inch X 2 inch grid. The most familiar block in this category is the Four Patch Block. 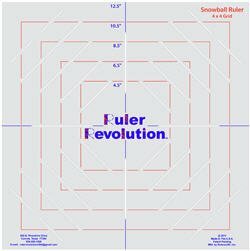 Use this ruler to produce perfect Snowball Blocks in five different sizes. This ruler also works well with the following grids: 2 inch X 2 inch, 4 inch X 4 inch, 8 inch X 8 inch, 16 inch X 16 inch, and 32 inch X 32 inch. This ruler can also be used to “Snowball” corners of rectangles. Explore the unlimited possibilities of this ruler. NO MORE frustrating little squares to sew or position in place.